Echoing in my heart is a beat to draw closer to God. It's a beat I want to hear and feel all the days of my life. His love has ravished my heart and taken me over. All I want is to be with Him forever, and often He's the only one I want to be with. My prayer is that He would pull me a little closer and take me a little deeper, that I may grow in knowledge of His heart. Closer by Bethel Live mirrors that desire. These lyrics are romantic (without the man, hehe). God's love is so much sweeter than anything I've tasted, and it is great for me. I am captivated and utterly fascinated by His perfect love. He knows me, all of me, and loves me with a pure and unashamed love. 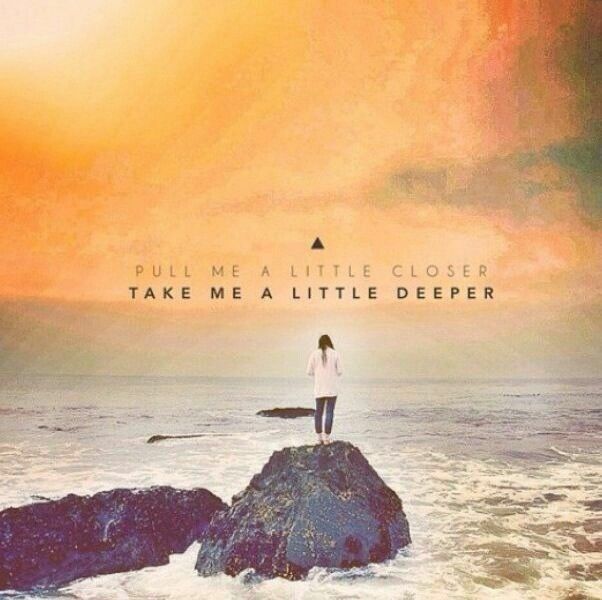 Yes, Lord, pull me a little closer and take me a little deeper. I know that this love can be scary, intimidating, and even foreign. And so I encourage you to step aside from fear, and pride. Let it all go and allow God to romance you. Allow Him to pull you a little closer. Allow Him to take you a little deeper. The reward is greater than the risk. You will taste a love that is sweeter than anything you've known, and will ever know. I pray that this beat may echo in your heart as well and spark a great love story.